The Oregon State Senate consists of 30 elected members. Senators serve four-year terms and represent districts containing about 127,700 citizens. 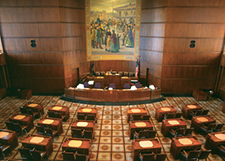 Oregon’s Senate Chamber features paneling and furniture of matched black walnut. Alternating designs of wheat and salmon, symbolizing Oregon’s agricultural and fishing industries are woven into the carpeting. The mural behind the Senate President’s desk is by Frank H. Schwarz and shows a street scene in Salem when news of Oregon’s admission to the Union was received in 1859.